After whetting my charcuterie whistle with a rip-roaring rillettes success, I thought the creation of something a little more adventurous might be in order. Being without certain items such as a meat grinder, nitrates and sausage casings, salamis and their ilk were out. I didn’t fancy smoking anything (not on a week night, at least) and I didn’t have the patience for curing. This left pâté. If you have ever felt the pressing urge to experience life as a mentally unhinged doctor from a late Victorian gothic horror or empathise with the deranged protagonist in a David Cronenberg movie, then making pâté is an excellent place to start. If, on the other hand, you prefer to see your food neatly packaged in cellophane bearing no resemblance to any living creature or are liable to feel a little nauseous at the sight of blood and guts then I’d advise you stay away. Well away. This isn’t for the faint of heart or the weak of constitution. All good pâté begins with liver. Liver, like all offal, is a foodstuff that featured rarely in my childhood and only now am I tip-toeing into this murky world. My only memory of liver was being presented with a seething brown mass topped with a hemi-sphere of mashed potato during one school dinner. It’s liver, I was told. With a trembling fork I lifted the tiniest possible piece to my mouth and took it between my teeth. I remember the harsh ferric smell and the gritty texture. I remember the dark brown colour and the slimy grey onions in the drab gravy. And I remember a swelling tide of bile making its way up my gullet as the weird meat like substance shifted around my mouth. I sat there for what felt like days whilst it congealed and grew cold on my plate. Just eat half, said my primary school teacher. Half? Oh good god, please no. I don’t remember the outcome, perhaps I blacked out or have packaged away the memory somewhere deep in my sub-conscious but that was my last experience with liver: as a timid six year old far, far away from the comforts of my mother’s cooking surrounded by giant teachers and snotty nosed compatriots who all seemed to be able to eat the disgusting bubbling brown mess on their plates without too much trouble. I went home that day and asked, nay demanded, that I take a packed lunch to school every day. But the scars could not have been that deep because last week while at the butchers I spotted some fresh pig’s liver on the counter and was intrigued enough to buy it. 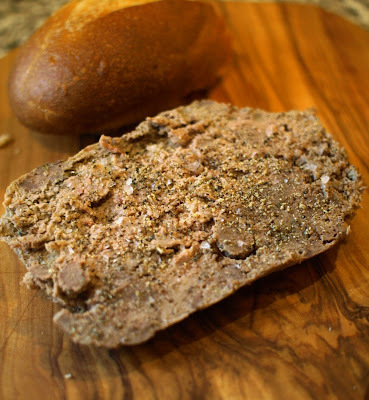 Much like with rillettes, the constituent parts of pâté are cheap. For a little under three pounds I was able to buy a kilo of organically reared Gloucestershire Old Spot liver from a pig I was assured had led a happy life. This would be enough to make a large loaf of pâté, about a kilo and a half in total. Considering you pay about three quid for a tiny slice of the good stuff in a deli, this was too good a bargain to miss. Having only ever made chicken liver pâté, I assumed, wrongly, that the process would be the same no matter which animal’s dark organ was lying on the counter. Slice, fry in butter, add booze, blitz in a food processor then leave in the fridge covered in a layer of melted butter. …it becomes a little trickier and a lot more time consuming. I used the catch-all recipe from HFW’s River Cottage Meat Book and so was prepared to get a little mucky during the process. What I wasn’t prepared for is just how sticky raw liver is. It behaves like some weird 1950s B-movie monster gradually sliding across the plate, finding its own level and seemingly multiplying at will. By the time it had been picked over and sliced, it appeared to have doubled in volume and I was growing increasingly concerned as to whether it would fit into the loaf tin I had prepared. 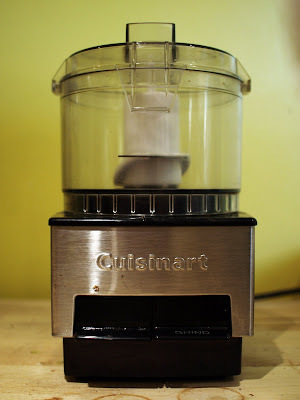 The next step was to blitz up the various ingredients in my tiny food processor. Fine, I thought, no problems here. The resultant gloop (half an hour of whizzing, pouring, scraping and refilling) was, quite frankly, disturbing and if you’ve never tried to mince pork shoulder with a stick blender I don’t recommend trying. By the time everything had been thoroughly mixed and blitzed and processed I was slightly concerned that my sleep time would be plagued with horrific visions. Regular readers will know that I don’t squeam easily. I’ve gutted things, I’ve cooked trotters and ears, I’ve sniffed and munched on durian, I’ve tried century eggs and even come very, very close to eating salted bugs (until a small Thai lady shook her head with a slightly concerned expression on her face) but a pork liver smoothie was almost too much. Almost. Thee are no pictures, for obvious reasons. For the cooking, the mixture (‘pretend it’s a cake, pretend it’s a cake, pretend it’s a cake…oh jeez it’s pink and lumpy and smells like wet rust) was seasoned and poured (more like slopped) into a loaf tin and covered with a double layer of buttered foil before being placed into a roasting pan filled with water. After an hour or so in the oven, warm meaty smells were starting to fill the kitchen and it was removed from the bain marie ready to be pressed (cue enormous heavy wooden chopping board) and cooled. By this time it was getting late and the prospect of homemade pâté that had only recently looked like a special effect was not too appealing, so I waited hoping that time and a sleep would ease my prejudice. Which is exactly what happened. I had my first slice for lunch the following day and was completely, utterly, totally and unashamedly won over by the flavour and general texture. It wasn’t coarse like a pâté de campagne but nor was it too smooth. It had enough resistance to be meaty and a subtle taste that was nothing like the iron-y tang of liver. Definitely one to be recommended. Sounds a bit grim but I have a strong stomach. Maybe it was the volume that was so off putting? I like the sound of this but I think I might start of with about 200g and make it in ramekins! Well it sounds delicious in the end, but you have convinced me to stick with chicken livers! I seriously laugh out loud through most of your posts. you have a great sense of humor! glad the pate worked out for you. I haven't had pate in years. but my favorite is still a green pepper goose liver pate that I used to buy at Fremantle Market (Perth, Western Australia) when I was in secondary school using my weekly allowance. What expensive and discerning taste I had way back then. I would never in a million years try to make pate myself. You're a true gastronomic artisan. I realized that I meant to write green peppercorn goose liver pate - not green pepper. Oh man, just reading that post is like watching a b-rate horror movie -- grimly fascinating, and hysterically funny. I've never been one for the metallic-y taste of liver or pâté. I don't think me and offal were meant to be, but I'm very impressed by your amazing feats. Your liver pate looks delicious! P.S. I have an award for you over on my blog! Katie - it was a little stomach turning but perhaps you're right, a little less may have been easier for a first time. foodycat - it's no bad thing sticking with chicken livers. Very tasty indeed. jen - thanks Jen. I know, it was a real pain but it turned out OK in the end! Nice, £3 for a kilo! might go and check the butchers at the top of the road, being London there might be a 50% mark up! I would get the terrine book, My Bro got me one in NYC and it is very, very good. Haha, I guess you just have to keep your eyes on the result. I agree with you about liver though, it has one of the strangest textures when it is uncooked. A laugh out loud post, with a delicious outcome! Extremely entertaining post and I love the happy ending! I may start with chicken livers though. You are a brave man. Great post and nice job on the pate. I used to make a chicken liver pate that I thought was pretty tasty except it wasn't really authentic, I suppose. Thanks for commenting on my blog. matt - I have to admit, it took me a little by surprise. kittie - thank you very much, glad you enjoyed it. You should try it - let me know how you get on.